Now that lectur es have started, you might be wondering where to find materials for your new modules. Many lecturers use online reading lists to recommend books, journal articles, and other useful materials to read each week and to help you find materials for your assignments. You should find your online reading list via the left-hand menu on Blackboard, and it will contain real-time information on the availability of print materials in the Library, as well as links to e-books, e-journal articles, videos, and scanned extracts of key readings that your lecturer recommends. Watch our quick video introduction with all the key features of your online reading list. 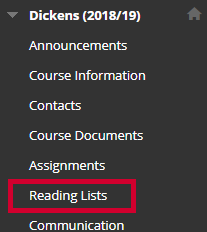 If you’re a returning student, you might have spotted that your reading lists look a little different… Over Spring Term last year we trialled a new look and it received positive feedback. Real-time information on library availability without leaving the main list – click on the title of the book you’re interested in, and you’ll see the call number and number of copies displayed below. Online resources (including scanned chapters) are available via the ‘View Online’ button on the right. You can use the drop-down menu at the top of the page to filter by physical/online resource; importance level (Essential, Recommended or Further reading); or by Week if this is available. 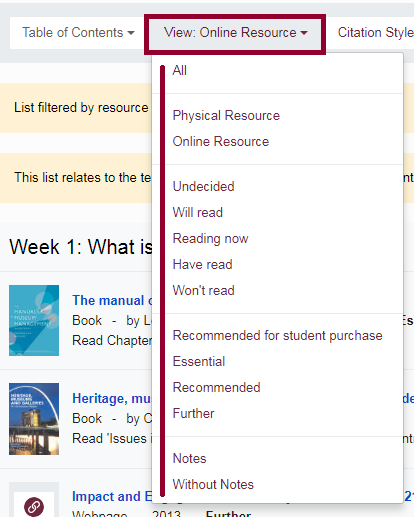 This can help you to manage your readings week by week – but if you’re looking for a specific item use the Search at the top of the page. You are also able to create an online reading lists account and make notes on items, or mark items as ‘Read’ – these notes and labels are only visible to you, and you can use these to manage and keep track of your readings. For more information on using these features of your online reading list, or for any other questions, take a look at our guide for students. This tip was written by Kim Coles, Course Support Co-ordinator. This entry was posted in Info tip and tagged #FYWtips, organisation, reading lists, studying. Bookmark the permalink.